Allied Bank, with its existence of over 75 years. has built itself a foundation with strong equity, assets and deposit base. Allied bank required Management Trainee Officer. in accordance with the bank corporate strategy and its human capital needs. Allied bank jobs are very good. Many people are working in the Middle East. You have the best chance to do this job, do not miss the opportunity to get this job. Excellent jobs have been announced by Allied Bank in which men and women can apply from any city in Pakistan. Successful candidates shall attend a formal and structured training process, which is a combination of the classroom. Allied Bank latest new job in 2019. You may have any questions regarding the Allied Bank job, you can ask the following questions. MBA, MBIT, M.com, Master in banking or finance and business or four years BB honors. 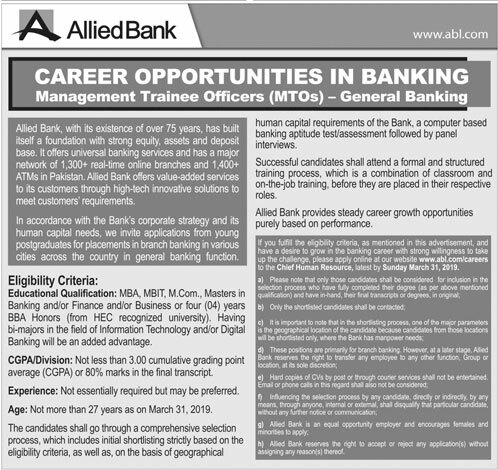 How to Apply for Allied Bank Limited Management Trainee Officer Jobs 2019? You can apply your laptop or mobile phone online through the Allied Bank job. If you fulfill the eligibility criteria as mentioned in this advertisement so please apply online at our website www.abl.com/careers. You can apply freely in Allied Bank jobs and you will not have to submit a single deposit.